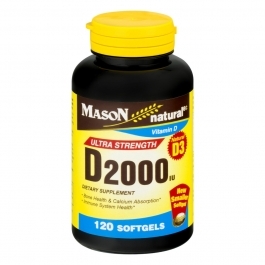 Mason Natural D 2000iu. This ultra strength dietary supplement supports bone health & calcium absorption and helps in maintaining a healthy immune system. Contains no added milk, egg, crustacean shellfish, peanut, tree nuts or wheat. Adults - one softgel daily, as a dietary supplement, preferably with a meal.